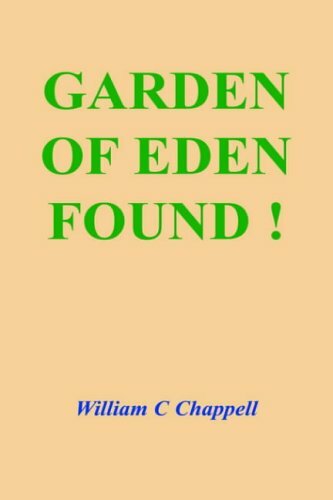 Home William Chappell Garden of Eden Found! Title: Garden of Eden Found! William C. Chappell, the author of this book, is originally from Tyner, Jackson County, Kentucky, and born in 1944. He was raised in a Christian family on a small farm among the rolling hills of Appalachia. William is a 1967 graduate of Berea College and has been a member of The Church of Jesus Christ of Latter-day Saints since 1974. He retired from a career with the Kentucky state government in the year 2000. The author has been blessed with inspiration, whereby he has come to the knowledge of the truths revealed in this book. He does not claim some special intelligence or righteousness. He does claim that these things have become known to him by the spiritual gift of the word of knowledge. The author's purpose is to reveal the exact location of the Garden of Eden, the meaning of the six days and six nights of creation, and the interpretation of the symbolism in the Book of Revelation.